• 1,892 sq. 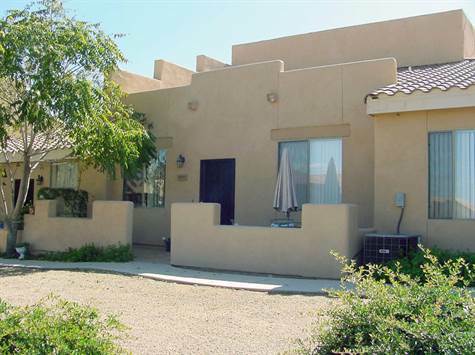 ft., 3 bath, 3 bdrm 2 story "Main living on 1st level" - MLS® $170,000 - PREFORECLOSURE-Come see! Cottonwood Square, Cottonwood - Great opportunity-rare large townhome w/ Convenient in-town location. Clubhouse w/pool. Low maintenance, close to shops, restaurants,services and Mingus Union High School. Big 3 bedroom w/main living on 1st level & huge 20x12 room currently being used as 4th bedroom but could be family room, office, craft/hobby room or whatever fits your needs. Vaulted ceilings in living rm, ceiling fans throughout, roomy dining area, walled entry patio w/mountain views & backing to unusually large open common area. Units are turned inward w/garages on street. Front doors open onto the interior common area, inviting a neighborly feel. Pre-foreclosure forces quick sale, here's your chance to scoop up a bargain.